Communication is one of the central aspects of the Chaos Communication Congress, both verbally, physically and digitally. 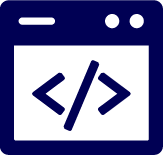 In this article I will dive into some of the different systems and infrastructures that help to make CCC what it is. I will go through six communication systems/platforms that are used during the congress. It can be hard to grasp the scale as well as the complexity of this infrastructure, especially when you know that this is all done by volunteers. To create an overview I will review them one by one. As with almost all modern life, access to the internet is seen as essential. And at an event like the Chaos Communication Congress it might be even more important. This year’s Congress set a new record in Up and Downstream capacity. The network team known as NOC, managed to get a ludicrous connection up and running with a maximum capacity of 500 Gigabit pr. second. That is a full 150 Gigabit more than the year before. Even though most people these days mainly use Wi-Fi at an event like this, most participants want a proper cabled connection, both for security, but also to have a chance to properly utilize the crazy bandwidth available. That is why there is always a network switch within range, almost wherever you are. To make sure you can get connected, the NOC suggested bringing a 10-15 meter ethernet cable as well as your own switch if you wanted. There were already 186 switches distributed around the event, as well as 286 Wi-Fi access points, managed by 9 routers. The NOC registered around 24.939 unique MAC addresses on the network, and a max of 10.821 concurrent Wi-Fi users. 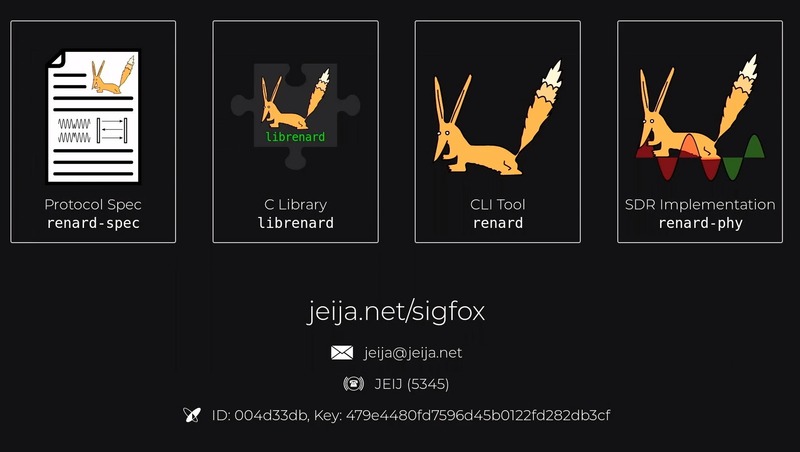 For the past many years, the NOC and the users have played a kind of cat and mouse game. The network group has tried to supply as much bandwidth as possible, while the users tried to catch up, trying to live up to the slogan of the network group, “Use more Bandwidth”. Last year someone used a lot of bandwidth to write “34C3” on the network graph using Morse code, and this year someone wrote “Use more Bandwidth”. But even with all this traffic the network usages peeked at only 38,4 GBit/s, with an average load of 15,9 Gbit/s. The main way to get in contact with other people at CCC is by bringing a DECT phone. DECT stands for Digital Enhanced Cordless Telecommunications, and is a widely used cordless phone standard for both private homes, and large companies. 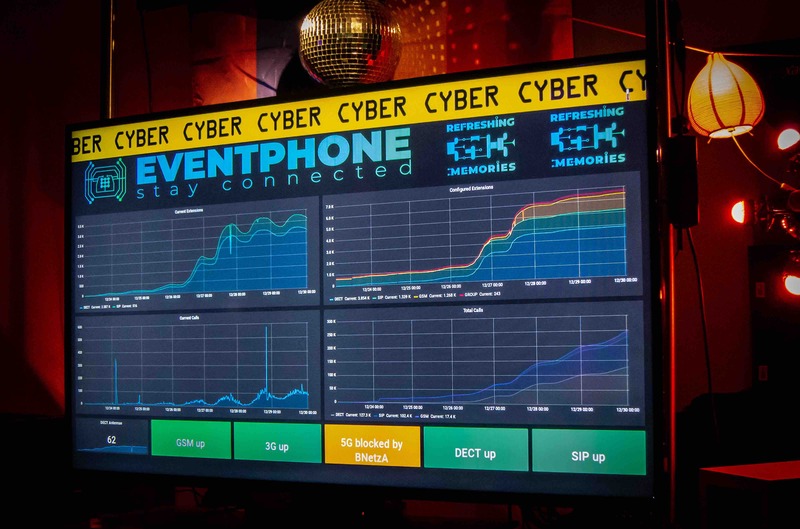 The DECT system is run by a group called Eventphone using a system they call PoC or Phone Operation Center. The group has managed to get their hands on a used large scale DECT system, from a bankrupt shopping mall, that now is the core of the CCC DECT system. The system has been operating since 2001 with 19C3 in 2002 being the first Congress with a DECT network. At 35C3 a total of 3.854 DECT handsets got connected to the network, and they made around 129.000 calls in total. So, what can you do with all this? Since its first run, the functionality and services of the DECT network have evolved a bit. Besides being able to call everybody else on the network, one of the many DECT services provided, was live translations into multiple languages of many of the talks at CCC. You just called a specific number to listen to a live translation of the running talk. This service is being phased out though, since it is not feasible with so many users on the network, and the translations have been moved to other platforms. All essential services like the Infordesk, Network Operations Center, Security etc. had their own DECT number. Here is one of my favourite use cases for this system: After many of the talks, besides the speaker’s email and twitter handle, many had their DECT number on the last slide. If you wanted to get in contact with a speaker and ask them some extra questions or ask if you could hang out a bit, you could just call them. Example of a last slide from a talk that shows the speakers DECT number. The network had an external SIP extension, so you could also call all phones on the network from your mobile phone, and you could even call all German landlines and cell phones for free from your DECT handset. At some of the previous events it was even possible to make free calls to the rest of the world. The DECT network stretched beyond the conference. It also covered two of the hotels where a lot of the volunteers were staying, as well as at least one of the trams. So, if you were lucky you could have full coverage from the conference to your hotel. 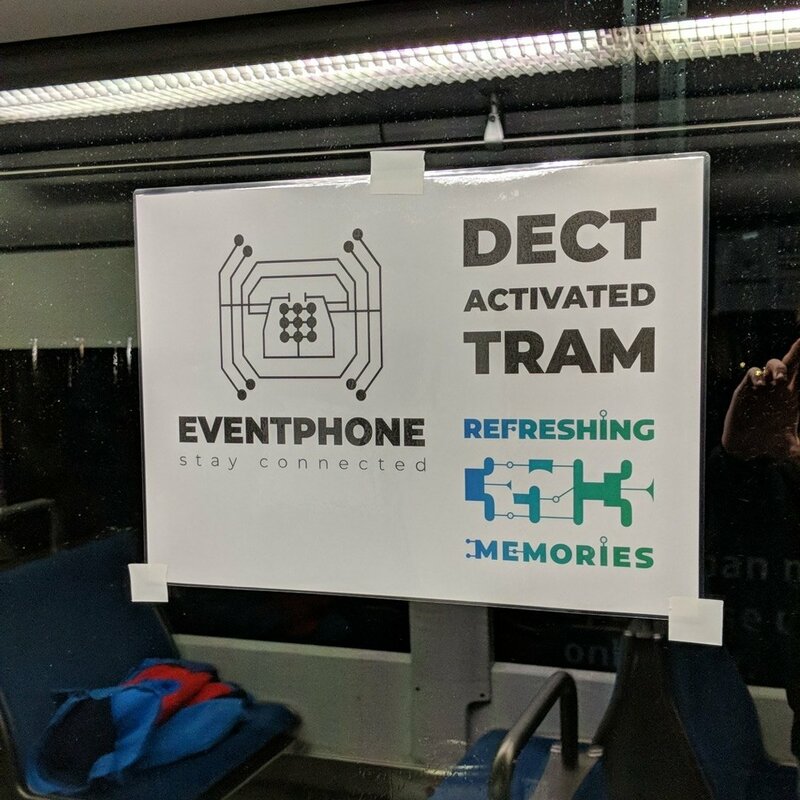 Sign that showed when a tram had DECT coverage. As if it wasn’t enough to have one phone network at the congress, then since the 25th congress in 2011 there has also been a dedicated GSM network running on the open source mobile communication GSM stack, Osmocom BB. The congress has been one of the biggest testing grounds for the system, and at the last congress there were 1.563 SIM cards registered to the system, with a peak of 903 simultaneously connected devices. All this was handled by 10 GSM base stations and 12 UMTS/3G base stations. To be able to do all this legally the German phone company Telefonica had lent the team running the system some of their frequencies for free for the duration of the event. And for the UMTS/3G, they made a little hack by using one of the US UMTS frequencies at 850MHz, not used in Europe. For that they just had to ask the German authorities for permission. 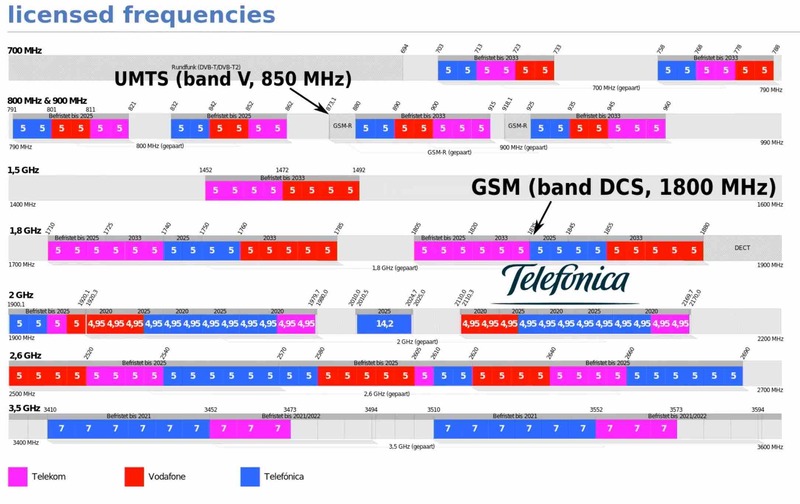 Not easy to find an unused frequency for playing around with GSM and UMTS anymore. In Germany there used to be some test bands, but now they are all used. To use the network, you needed a 2g/3g compatible phone, to buy a SIM card from the EventPhone team, and to use the same self service website as when registering a DECT phone. Besides being able to call other phones on the network as well as sending SMS, you could access the same services as with the DECT system. You could even make outbound calls to the rest of the world for free. As an added bonus this year everybody using the network with a 3G capable phone also got a data connection. At times users could reach speeds of 10 MBits/s, while at others it didn’t work at all. But the GSM part was stable, and during the event the Osmocom team even managed to get handover up and running, so you could roam between the different base stations. 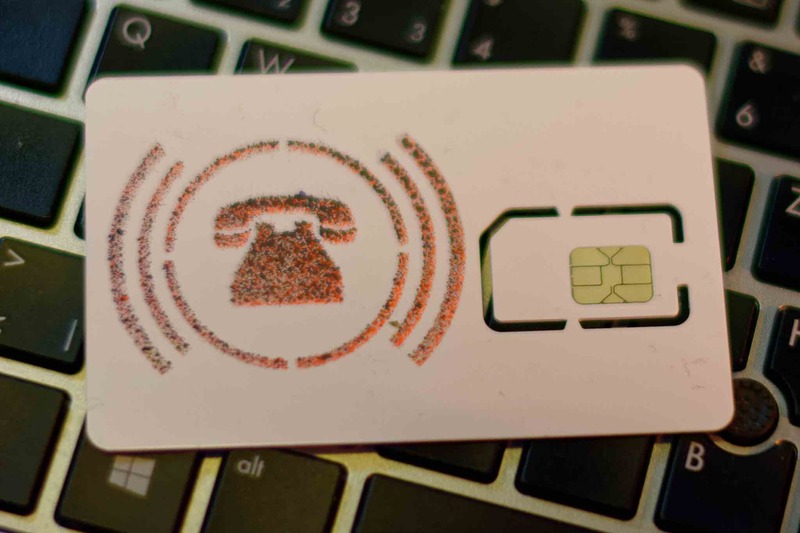 Sim Card for the internal GSM network, this one got decorated with the Eventphone logo. If your phone used a Nano sim, they had a special cutting tool to punch that out for you. If you are more a fan of using an old school landline, the Chaos Vermittlung got you covered. And when I say old school, I mean the kind that requires a manual switchboard and runs on batteries. 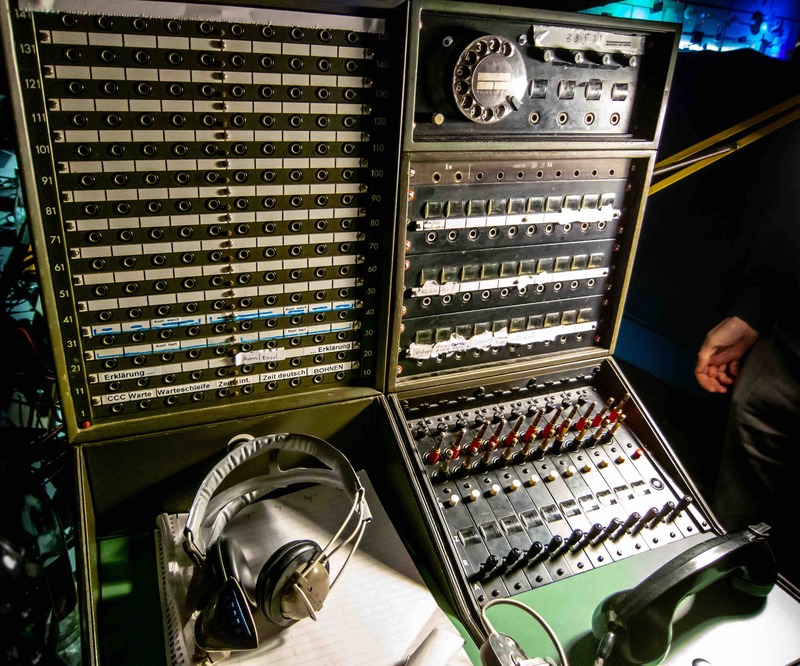 Adjacent to the vintage computing assembly the Chaos Vermittlung had set up a full switchboard as well as 10 publicly accessible field telephones, as these types of phones are called, spread out in two of the halls. There was also the option to add one’s own phone to the network. The main switchboard for the Chaos Vermittlung. Network had gotten some nifty upgrades, like line hold music, a speaking clock to tell you the time, and a complete integration with the DECT and GSM network. So, you could call everyone on all the other networks. And because the Chaos Vermittlung are just a tiny bit nerdy about all this, you could of course also call every phone on the field telephone network, from any phone on the other networks, or even from normal phones. If you are not into all these new digital and electronic communication infrastructures, luckily there is Chaos Post. Chaos Post is CCCs own internal postal service, with which you can send a postcard, a letter, or even a small package, to anyone at the congress. And provided you could give a location, a DECT number, twitter handle, or some sort of description, they would deliver it. The Chaos Post also delivered food, drinks and other stuff. They also had what they called a proxy to the Default World, where you could send a postcard for free to anywhere in the world. By the end of the conference the Chaos Post had handled 2.917 postcards to 41 different countries in the Default World . There were 5 places where you could post you mail or post card, and you could also phone in a message to be sent. 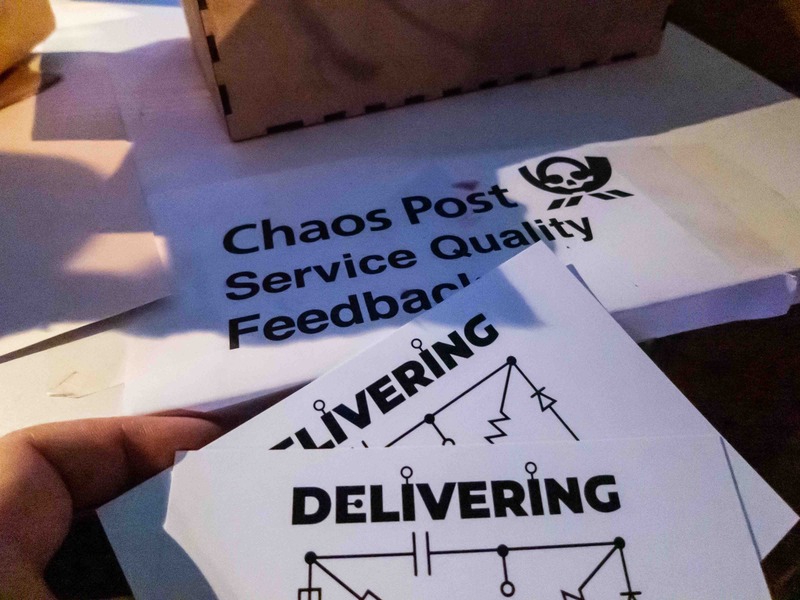 If you wanted a side quest to your conference experience, you could go to the Chaos Post Office and ask if you could deliver some mail. If you were lucky you got a postcard that instead of a handle or a location said something like “to the most sparkling robot”. It’s a good excuse and an alternative way to meet new and interesting people. 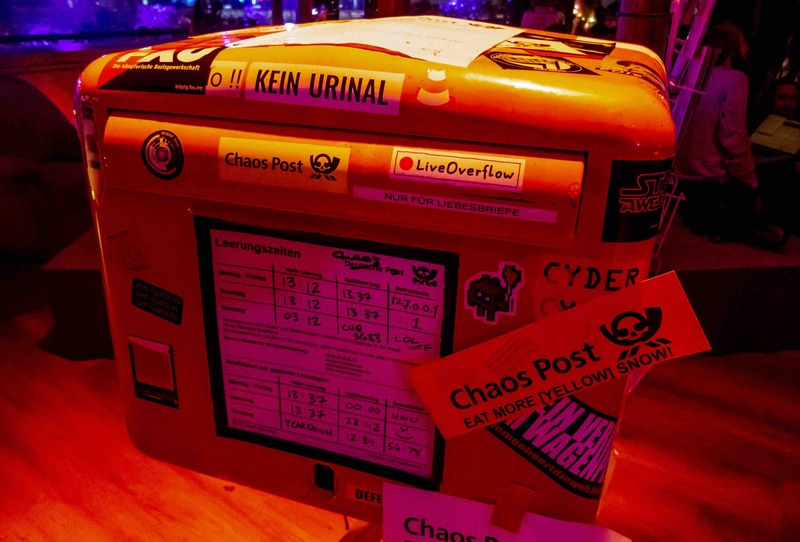 One of the 3 Mail drop points at 35C3. Handing in postcards for the Chaos Post. This is not a joke or a spelling error. There has been a pneumatic tube system at CCC for six years now. The name of the system and the group behind it is called Seidenstrasse which in English translates into “Silk Road”. Seidenstrasse only covers some of Hall 2, but still has three exit nodes, a switching node, and a main node. It is made from drainage pipe, four vacuum cleaners, and some electronics to control it. You could send almost whatever you wanted through the system, as long as it fitted inside a well-defined capsule and the total weight of the capsule and content did not exceed 500 grams. I was told that somebody once sent a bottle of Club Mate, the favourite beverage of people at CCC. When the pipe took a sharp bend, the bottle just continued straight ahead and somehow surviving. After that situation the requirements got a bit stricter. 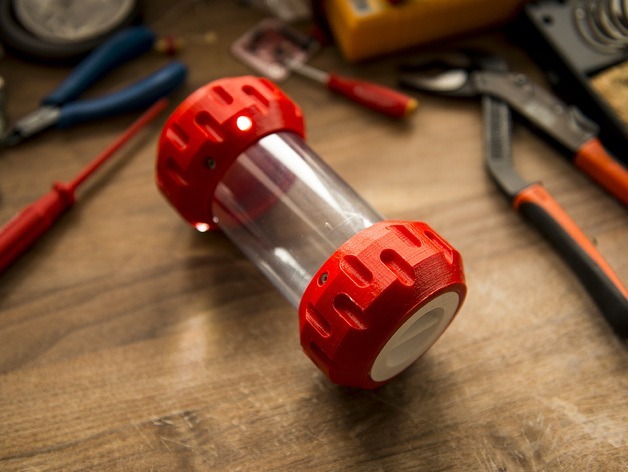 Another requirement is that a capsule needs to have at least one LED in it, to help debug the system, in case a capsule gets stuck in the pipes. Everybody can use the system, and there are a couple of capsules available that can be used. You could also bring your own capsule, and there are links to some designs on their site. One of the Capsules designed for use with Seidenstrasse. This one is mostly 3D printed and have 3 built-in LEDs for debugging purpose and just looks cool. Seidenstrasse is of course also connected to all the other infrastructures, so you can in theory send a postcard through Chaos Post, have them call the Field telephone via DECT, getting routed to Seidenstrasses main node, and have them send a capsule with a message to the bar, with an order for two bottles of Club Mate. Testing out Seidenstrasse with a 3D printed Capsule, delivering glowsticks to the bar.